From time to time, we like to write about one of our students whose musical journey really shows what Music House is all about. Joe Pauli is one of those students. 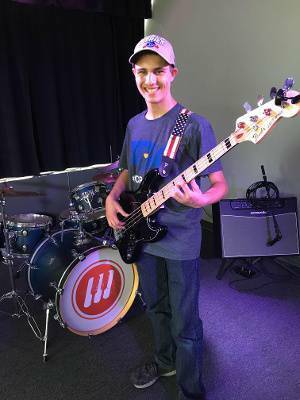 Joe, a 17 year old bass player, who also sings and plays keys, is in his third year at Music House. He started out taking bass lessons, and soon joined one of our rock bands. Since then, he has auditioned to move up to more advanced level bands, and has been moved up twice. Currently in a FOCUS level band, Joe plans to try for a MASTERY level band, Music House's highest level band. When asked about his experience at Music House, Joe says his most rewarding experience is "playing with others and writing our own music." He also enjoys collaborating with other musicians to improve the original songs they have written. "Joe is always seeking out new and interesting music, and putting those new ideas into his playing. He's the rare student who works on his own to explore music, but shows equal enthusiasm for the assignments I give him. Being a Rush fan, he also sings and plays keys." "I love seeing Joe on stage! He looks really happy! 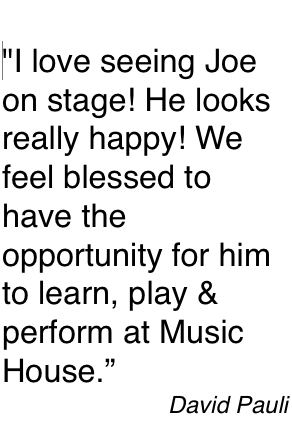 We feel blessed to have the opportunity for him to learn, play & perform at Music House."